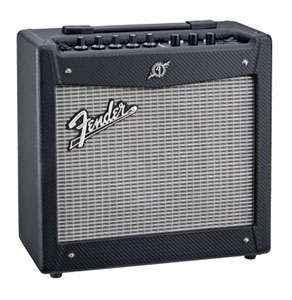 Mustangs don't run with the herd, and Fender is hoping it's new line of Mustang combo amps will break out and run free as well. With MSRPs ofe belwo $200 and $300 respectively, the Mustanmg I and II are aimed at players who want great, old-school sounds in s samll package with modern features. Mustang I is a 20-watt closed-back combo with an 8” Special Design speaker that sounds great and pumps serious volume. Mustang II is a 40-watt closed-back combo with a 12” Special Design speaker that sounds great and pumps serious volume. Each contains 24 highly accurate on-board amp presets with tones from vintage Fender sparkle to outrageous modern metal distortion, and a bank of 24 built-in effects including chorus, flanging, phasing, tremolo, vibratone, step filter, reverb, echo, octaver and more — 12 modulation effects and 12 delay and reverb effects in all. It’s great for practice and jam sessions, and an 1/8” headphone jack lets you play loud, even if only for yourself. Further, connect either Mustang ampto your computer with free Fender FUSE software. Open up a world of possibilities, including on-screen parameter control, deep editing, additional effects, unlimited preset storage, online preset swapping with the Fender FUSE community, and free Fender artist presets. An optional single-button footswitch controls two quick-access presets. Mustang runs from a very simple control interface, which includes gain, volume, treble, bass, master, preset select, modulation select, delay/reverb select, save button, exit button, tap tempo button — all easily navigated. Mustang™ I and II contain 24 highly accurate onboard amp models with tones from vintage Fender® sparkle to outrageous modern metal distortion. Easily connect to your computer to add to the number of amp models, too.